Every river flowing out of the Sierras (except for the Smith River near California's northern border) is dammed at least once before it reaches the valley. The Oroville Dam was completed in 1968 and filled the branches of the Feather River with Lake Oroville. Long, tall bridges were needed to cross these swollen river branches. Last week we looked at the West Branch of the Feather River Bridge. 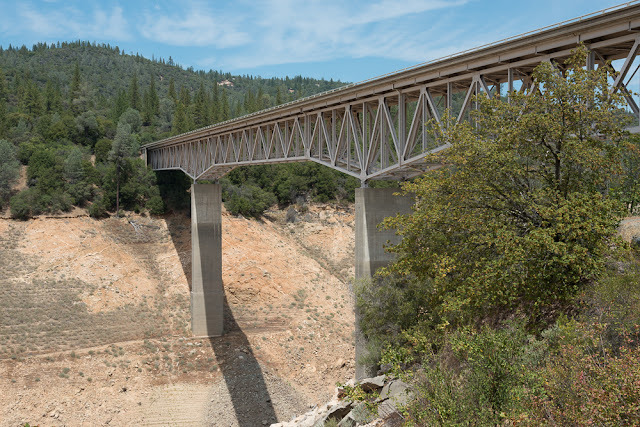 In today's blog we've moved to the southeast side of Lake Oroville to look at the Enterprise Bridge (carrying Lumpkin Road) across the South Fork of the Feather River. The Enterprise Bridge (12C0199) is a 1175 ft long continuous three span deck truss bridge that was built in 1967. As can be seen in the photos, California's drought has reduced the South Fork to a trickle. These continuous truss bridges were popular for medium long spans in the 1960's. However, I doubt if they would be built today. All of the bridges with spans between 400 to 1000 ft in length that have been built recently in California have either been concrete arches (like at Devil's Slide) or segmentally constructed concrete box girder bridges (like the new Benicia Martinez Bridge). California hasn't even built a long span steel girder bridge let alone a steel truss in many years. Butte County, California Bridges: Enterprise Bridge Carrying Lumpkin Road across the South Fork of the Feather River by Mark Yashinsky is licensed under a Creative Commons Attribution-NonCommercial-NoDerivatives 4.0 International License.